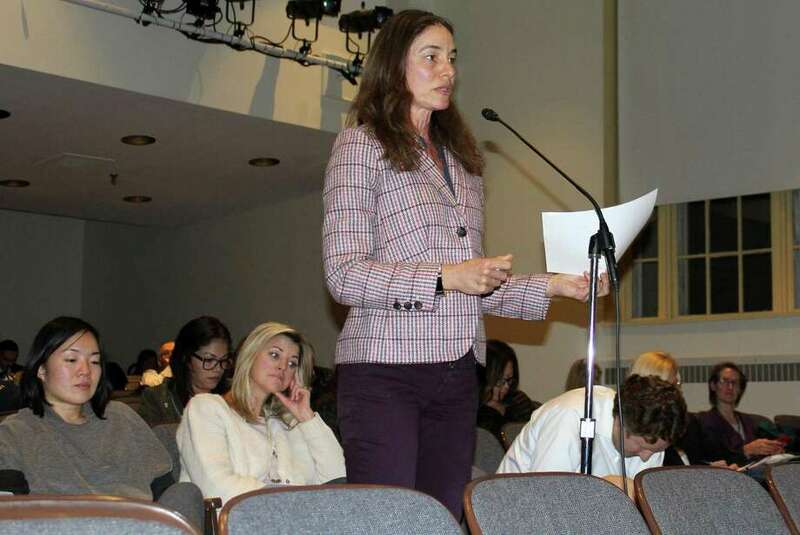 Parent Michelle Benner spoke at the Board of Education meeting in Westport Town Hall on Feb. 4. WESTPORT — Despite significant pushback from community members, the Board of Education voted Monday to reaffirm its commitment to the K-6 plan for the town’s sixth-graders following Coleytown Middle School’s closure. “We can’t negate the fact that we already made this decision. Yes, we always knew K-6 was more expensive, but we still voted to endorse it,” education board member Jeannie Smith said at the Feb. 4 meeting. Smith and her fellow BOE members Mark Mathias, Neil Phillips and Candice Savin voted to maintain the K-6 plan — keeping sixth-graders in the town’s five elementary schools for next year — while Vik Muktavaram and Elaine Whitney voted to move to a “6-8” plan, in which all middle school students would attend Bedford Middle School, as has been the case this school year since Coleytown closed. Whitney voted for the K-6 plan in December, but changed her mind Monday citing the complexities of the K-6 plan, which include the placement of 14 portable classrooms at the elementary schools. “I was hoping by this point I would be feeling better and better about all the ways we could solve the problems and challenges with K-6. I’ve become increasingly uncomfortable we can deliver education in an excellent way with it,” Whitney said. Several parents spoke out against the K-6 plan, citing the high cost of leasing 14 portable classrooms at the elementary schools. At the Jan. 28 BOE meeting schools Chief Financial Officer Elio Longo projected a $2.7 million cost to lease the 14 portables for two years, which was much higher than the board expected when it approved the plan. “We’re throwing money away on the rentals that could be used for short-term and long-term solutions,” Long Lots parent Candace Banks said. Portables pose their own health hazards, parent Michelle Benner said, adding Westport will be known as “the portables district” if the K-6 model goes into effect. “Many parents are looking to move, looking to put their children in private schools, and I really feel strongly you cannot blame Elliot Landon for these problems,” Long Lots parent Alison Keisman said. Long Lots Elementary is town’s most populated elementary school. Many parents at the school have spoken out against the K-6 plan saying Long Lots students will not be treated equally to students at other elementary schools. “I personally don’t see a parity issue between Long Lots and other elementary schools, so that for me is an issue I kind of set over here because we’re going to staff appropriately,” Superintendent Colleen Palmer said. “I think there’s a difference between parity and making sure we meet our educational standards for all students, because before this happened we did not have parity. At this moment we do not have parity. Yes, we will not have perfect parity under the K-6 model, but we don’t have perfect parity,” Savin said. The BOE members who voted to move forward with the K-6 plan said the model provides a better and more appropriate educational experience for the sixth-grade population per the recommendation of Palmer. She reaffirmed her support for the plan, saying the sixth-graders would thrive more in the K-6 plan than under the 6-8 Bedford model. In spite of disagreement about what to do while Coleytown is closed, board members agreed the school should reopen. The BOE established a Coleytown Building Committee at its Jan. 28 meeting, and First Selectman Jim Marpe said he’s working to expediently plan for the school’s reopening. “This is about our brand of Westport, our image as a community. It’s about our property values, both in a narrow focused way in the Coleytown area, but in fact throughout town because if in some way we’re viewed as a community that’s not committed in the right way toward education, and supporting that through quality structures, I can see where there’s potential for the whole town to be impacted,” Marpe said. The Coleytown Middle School task force also presented its findings at the Feb. 4 meeting. Coleytown will likely not be able to reopen for the start of the 2019 academic year, but could come back online by fall 2020 if the town works expediently to execute short and long-term fixes at the school, task force chair Vanessa Valadares said. This timeline aligns with the projected reopening dates of the other two reports commissioned by the Board of Education and especially the KG&D report, task force member Jay Keenan said. “What we believe is the short-term repairs are more than just a band-aid. We believe that it will really get the building in very good shape and will give it a longer life until you do some long-term repairs. We believe that the long-term repair is necessary to the building, but doesn’t need to get done right away,” Valadares said.